Swanson’s indebtedness to Patricia Highsmith is clear, particularly to Strangers on a Train. Like Highsmith, he uses a meeting ‘in transit’ as a temptation scene in which an accidental acquaintance seeks to draw out hidden thoughts, and we, as readers, are teased into reflecting on the self-justifications of the murderer. The scenes in which Lily coaxes Ted to commit murder are very reminiscent of a famous moment in Hitchcock’s film version of the Highsmith novel, in which Bruno Anthony says to Mrs Cunningham, “Everyone has somebody that they want to put out of the way. Oh now surely, Madam, you’re not going to tell me that there hasn’t been a time that you didn’t want to dispose of someone. Your husband, for instance?” Lily’s function, like that of Bruno, is to give expression to unconscious desires – and to the conviction that there are, surely, some people who deserve to die. Once the plane touches down on the East Coast, the seductive thought that one might commit murder begins, of course, to seem less abstract and more fraught with complications. A somewhat prosaic tech entrepreneur, Ted is besotted with Lily but increasingly uneasy about the course of action to which he is committing himself. 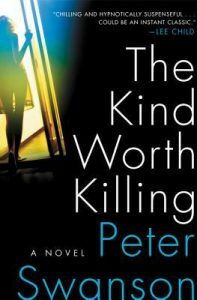 Lily sees herself as “special”, as having been “born with a different kind of morality”, and we soon discover that she in fact inhabits a moral universe in which rather many people qualify as deserving murder victims. Swanson’s plot is deftly and intricately designed, with numerous twists that genuinely take us by surprise. In comparison to Highsmith’s work, this is a novel very much driven by plot rather than by nuanced psychological portraits or morally probing explorations of the choices that people make. But Lily is a strong central figure, and Swanson grips our attention with the deadly cat-and-mouse games being played by several of the main characters. There are two or three murderers or potential murderers, all of whom have their own secrets and their own reasons for wanting to dispose of people. Swanson makes nerve-racking use of the uncertainties this generates. We are kept in suspense about who will survive and who might stand a chance of turning the tables. What will happen as others engineer killings of their own? How far will Lily get with her freedom intact? Does she deserve to be punished? Will she be? Swanson is not unwilling to sacrifice characters to whom we have grown attached, and he keeps us on the edge of our seats til the end. A thoroughly enjoyable and addictive thriller.